When Operencia: The Stolen Sun was revealed last year at the Kinda Funny Games showcase, I wasn't quite sure what to make of it. I'm generally a fan of first-person dungeon crawlers, but I was skeptical that one developed by a studio most known for various pinball games could scratch that itch. Still, the original reveal did catch my attention with some pleasing aesthetics and world design, so I decided to give it a shot. Operencia starts out in a relatively straightforward manner. After a cold-open prologue, the main character is introduced reliving a recurring dream, where a mythical stag leads them to an underwater castle. Taking this as a sort of divine sign of the gods, the traveler sets off following the dream as a premonition, soon stumbling across the fated sunken fortress. After a series of events in these ruins, the sun illuminating the sky of Operencia mysteriously vanishes, and our dreamer sets off to return the Stolen Sun to its rightful place on the horizon. As stated, Operencia is a first-person dungeon crawler that unabashedly sticks to that classic RPG stylings. The most recent similar comparison might be InXile's The Bard's Tale IV: Barrows Deep, which released last year, although Operencia is generally a much more tapered and streamlined experience. The game is divided into several maps explored on a grid in step-by-step fashion. Within each of the game's various dungeons lie various foes and puzzles, which must both be overcome in your quest to return the sun to the sky. While the player can choose the gender and class of the main character (with a handful of portrait options), other characters that join the party are preset in this regard. However, each of these party members has access to a relatively concise branching skill tree, allowing the player some flexibility in how they construct their combat party. For example, your first companion is an aloof middle-aged thief named Jóska. He joins with some poison elemental skills, but you can instead have him focus on stealth and sneak attacks if you would like (as I did). As you recruit more party members to your band, you can include those that suit your preferences best. Luckily, all members always gain battle EXP, so you don't have to worry about benchwarmers falling behind. 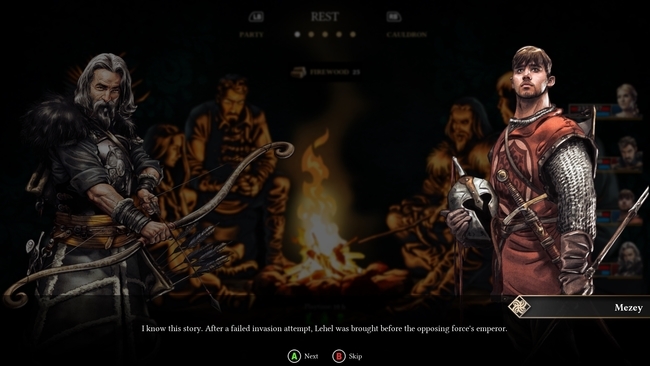 Unlike Barrows Deep, Operencia uses static character portraits to deliver dialogue and present most of the game's storyline. The artwork used is quite nice, giving the game a unique style that stands out from its contemporaries. 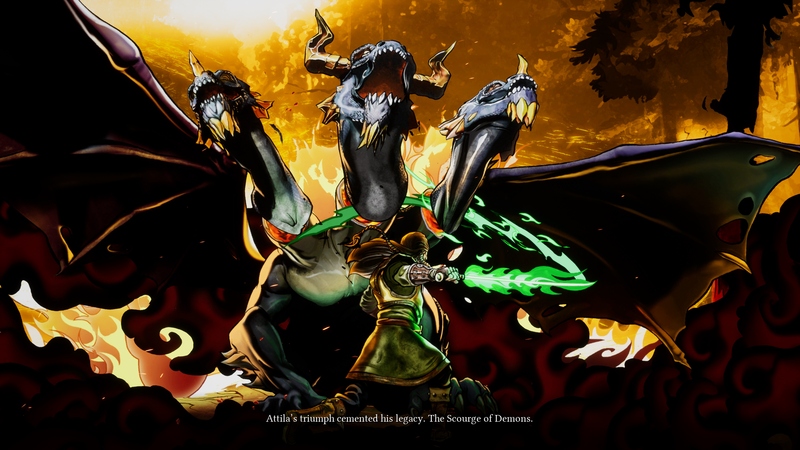 Throughout the game, a narrator will deliver lines of exposition, both during scene transitions and sometimes during regular dialogue, This shapes the narrative as though it was a tale given by a well-traveled storyteller. Some of the scene transitions throughout the game even utilize an animation style reminiscent of a pop-up book. However, the game's voicework overall is a mixed bag. While some characters, like Jóska, have charming deliveries with flavorful accents, others come across as extremely flat in their line reads. Whereas I found the narrative in Bard's Tale IV difficult to give my attention, the storyline present in Operencia was much more digestible. There aren't many straight cutscenes, but instead, most of the worldbuilding and lore is given when you stop at campfires scattered within each dungeon. Operencia doesn't offer a big epic narrative, but it does well to build a believable world through the snippets the player gets to see. While Operencia does have its fair handful of puzzles in each of the game's locations, it is not nearly as over-burdened with them as Barrow's Deep was. Puzzles are also a bit simpler, usually requiring operating mechanisms in some proper order. Oftentimes the cast of characters will offer their advice on how to solve each of these puzzles, sometimes giving away the solution a little too easily. Some puzzles will test you though, especially a few in the game's later dungeons. 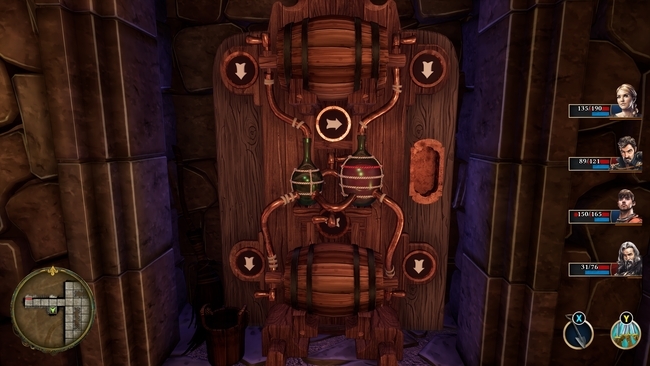 Each map also holds of a number of optional secrets to be found, such as optional smaller puzzles or false walls. Sometimes accessing these Secrets require key items obtained later in the game, so backtracking through previous areas can be rewarding with new loot and even optional boss encounters. The player can see their progress towards finding all these secrets on the map screen, so they act as a nice sort of collectible you can work towards. Operencia offers a somewhat typical combat system, but it is implemented fairly well. The game is purely turn-based, with the battle queue shown on the left side of the user interface. Each character has a pool of Health and Energy, which work how you'd expect, with Energy being the resource currency used when performing special skills. There are a variety of status effects and buffs/debuffs that can be used as well, and you'll have to be able to work these if you want to get through the game cleanly. Each character can learn a different set of skills, so sometimes it makes the most sense to use certain party members in different zones, especially near the end of the game. While Operenica doesn't have an exceptionally unique battle system, it's still a solid enough framework that offers some flexibility and customization for players to tailor a team to their liking. However, most of the game is not very difficult, allowing players to stick with routine strategies in getting through a good number of the game's labyrinths and boss encounters. Operencia doesn't have a difficulty toggle, but it does have a few options that can make the game less friendly. You can turn off automatic mapping and objective markers, and you can also reduce the rate at which the game autosaves. There's even an option for a permadeath mode, where a party wipe means Game Over. 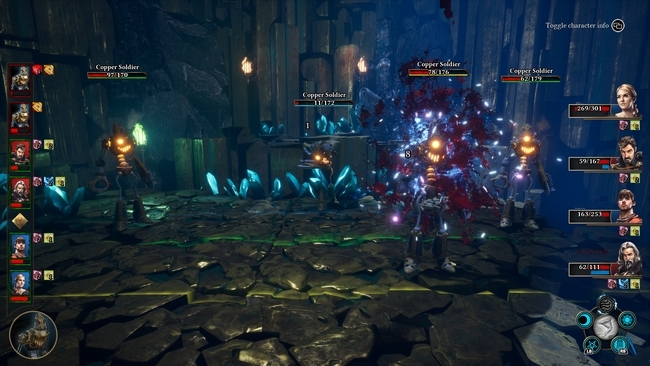 Being a new RPG from a small studio, Operencia is a relatively streamlined and linear game. The player won't have to make to many choices on what to do or where to explore, but filling out the various maps and secrets is still gratifying. Completing the game fully - solving all puzzles and finding all secrets - will take about 25 hours. Operencia: The Stolen Sun is a neatly packaged dungeon crawler with a nice style and satisfying gameplay loop. I found myself wishing that the combat was a little more robust or distinctive, or that the game challenged me a bit more throughout, but I enjoyed my time with it. I'm looking forward to seeing how Zen Studios might follow Operencia up in the future. Versions tested: PC via Epic Games Store. Operencia is also available on Xbox One and Xbox Game Pass.